During the eight years since the publication of Maintenance Excellence: Optimizing Equipment Life-Cycle Decisions the business environment has changed drastically. Globalization, consolidation, and changes in technology challenge asset management and maintenance professionals to be more efficient. Globalization and consolidation have been particularly instrumental in the changes in maintenance standards, approaches, and the use of technology to become more efficient and cost effective. 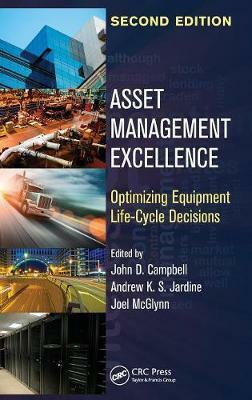 Reflecting all this and more, the second edition has been renamed: Asset Management Excellence: Optimizing Equipment Life-Cycle Decisions. Although there have been patterns and trends that have emerged around the world in asset management, the root principles are the same-personnel with tools go out to address the needs of maintaining assets. However, many of the tools, technologies, and thought processes have evolved and matured to allow a rethinking of the deeper maintenance processes. For this edition, a new set of authors and contributors have revisited the content, updated information, and added new content based on the passage of time, changes in thinking, and the introduction and improvement in technologies. John D. Campbell was one of a very few individuals in Canada who put Canadian expertise in physical asset management on the world map. He authored the widely used book Uptime: Strategies for Excellence in Maintenance Management, which was published in 1995 and by early 2006 had sold over 16,000 copies. He coauthored Planning and Control of Maintenance Systems: Modelling and Analysis and coedited Maintenance Excellence. In addition to being an author and leading thinker in maintenance management, Mr. Campbell was a sought-after public speaker, appearing once on television in the United States. He was a recognized subject matter expert and advisor in maintenance management to several of the world's most widely recognized organizations ranging from Disneyland to NASA, or "Mickey Mouse to Rocket Science," as he used to joke. He developed a very strong and internationally recognized maintenance management consulting practice in Canada, consisting of about 40 consultants. In recognition of that capability and expertise, PricewaterhouseCoopers appointed Mr. Campbell as its Global Leader for the PwC Physical Asset Management practice, consisting of about 150 consultants worldwide. With his sponsorship and support, the University of Toronto's Physical Asset Management certificate program was born in 1999 and continues to this day, franchised for delivery worldwide. Mr. Campbell was an incredibly busy person, but always made time to promote excellence in plant engineering and maintenance activities through his participation in numerous related voluntary events. He received, posthumously in 2006, the Sergio Guy Memorial Award from the Plant Engineering and Maintenance Association of Canada in recognition of his outstanding contributions to the maintenance profession. In 2000, Mr. Campbell began discussions with his practice director about potential updates to Uptime. Although he soon began a long battle with cancer, he helped put in place the thinking and necessary encouragement for that 2nd edition to be written and published. John passed away in November 2002, but his work continued: The 2nd edition of Uptime was published in 2006. His colleagues from PwC formed both a perpetual scholarship and award at the University of Toronto for leading students in the university's maintenance management course. Through those awards, Mr. Campbell continues to contribute to both excellence in asset management and support to students in need. Andrew K.S. Jardine is director of the Centre for Maintenance Optimization and Reliability Engineering (C-MORE) at the University of Toronto, where the focus is on real-world research in engineering asset management in the areas of conditionbased maintenance, spares management, protective devices, maintenance and repair contracts, and failure finding intervals for protective devices. Details can be found at http://www.mie.utoronto.ca/cmore. Dr. Jardine is also Professor Emeritus in the Department of Mechanical and Industrial Engineering at the University of Toronto. Dr. Jardine wrote Maintenance, Replacement, and Reliability, first published in 1973 and now in its sixth printing. He is coeditor with J.D. Campbell of the 2001 book Maintenance Excellence: Optimizing Equipment Life Cycle Decisions. His most recent book Maintenance, Replacement and Reliablity: Theory and Applications, co-authored with Dr. A.H.C. Tsang, was published by CRC Press in 2006. Besides writing, researching and teaching, Dr. Jardine has, for years, been in high demand as an independent consultant to corporations and governments the world over in matters related to the optimum use of their physical assets. Dr. Jardine has garnered an impressive array of awards, honors, and tributes. He was the Eminent Speaker to the Maintenance Engineering Society of Australia, as well as the first recipient of the Sergio Guy Memorial Award from the Plan Engineering and Maintenance Association of Canada, in recognition of his outstanding contribution to the maintenance profession. In 2008, Dr. Jardine receivd the Award for the Best Paper, which was preseneted in the category of Academic Developments and sponsored by the Salvetti Foundation, at the bi-annual conference of the European Federation of National Maintenance Societies, in Brussels. He is listed in the Canadian Who's Who. Joel McGlynn is an IBM vice president and the enterprise asset management global leader for IBM Business Consulting Services within IBM Global Services. He is responsible for creating IBM's asset management practice in 1995 and now manages over 1,000 consultants on many different asset management engagements. He has built IBM's asset management practice into the largest focused asset management consultancies in the world. He has accomplished this by creating an asset management framework and a holistic approach to managing assets that allows organizations to better optimize and align their asset investment to support their mission and strategy. He focuses on managing assets using a portfolio view across the asset's total life cycle, including: strategy and planning, evaluation and design, acquisition or building, operation maintenance, modification, and disposition. He also categorizes asset classes based on similar management attributes such as financial, real property, personal property, fleet, infrastructure, and continuous or linear assets. In recent years Mr. McGlynn recognized the emergence of smarter assets and the convergence of operational and IT asset classes. He is now heavily involved with IBM's smarter initiatives including IBM's Smart Buildings, Advanced Water Management and the Intelligent Utility Network offerings. He has over 20 years of experience in assisting clients to improve maintenance and manufacturing operations, inventory management, supply chain management, and procurement processes. Mr. McGlynn also assists clients in designing and implementing technology solutions to support these processes. Mr. McGlynn has emerged as one of the foremost thought leaders in the field of asset management. He is certified in APICS and both CPIM and CIRM.